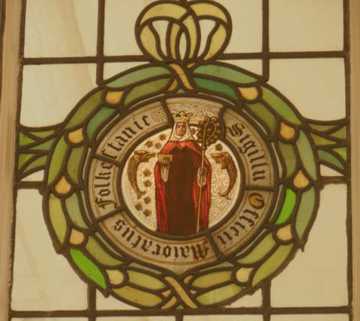 "Ethelbert, King of Kent, who was converted to the faith by Saint Augustine the Bishop, begat Edbald and Ethelburga the virgin, whom her father Ethelbert gave as wife to Edwin, King of the Northumbrians, as is more clearly set forth in the Life of that Saint and King which follows. Edbald, however, begat by Emma, daughter of the Franks, Ermured and Ercombert and a daughter Eanswida, who from infancy renouncing worldly pomps, studied to serve God, trod under foot all the treasures of the world, and having embraced the holy doctrine with all her might, longed with constant desire for the life of the heavenly kingdom, and meditated submitting herself to the rule of life of holiness. 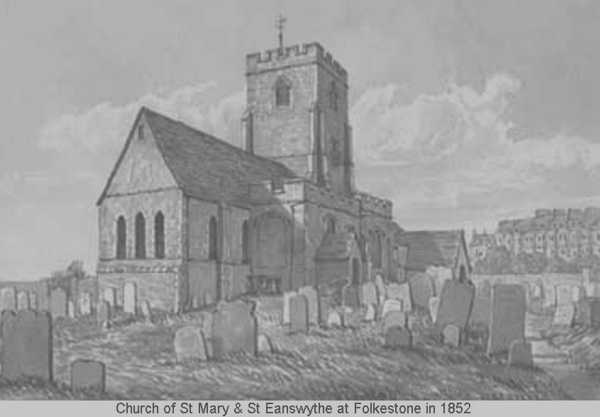 For the convenience of his observance she selected a suitable place, remote and unfrequented, called Folkestone, where also her father Edbald built a Church in honour of Saint Peter the Apostle." The remains of the buildings that St. Eanswythe would have known have now been lost, however St Eanswythe is remembered by the Church of St Mary & St Eanswythe. Tradition has it that St Eanswythe remains was saved by the nuns and secretly hidden. On 17th June 1885 a discovery was made by workmen preparing the wall o f the Sanctuary of an old decayed leaden coffer in which were a number of bones it was believed these were the remains of Saint Eanswythe. The report of an examination of the relics of St. Eanswythe in Folkestone Parish Church By Dr. P.H.Garrard, M.B., B.S., on 29th February 1980. Notes taken from Canon Scott Robertson, Honorary Secretary of the Kent Archaeological Society, article in " Archaeologia Cantiana, XVI " suggest that the remains of a female of 5ft 4in height and aged between 18 to 25 years could possibly well be St Eanswythe. Mr T.Tatton-Brown, Director of the Canterbury Archaeological Trust suggested that "The only way we could really confirm, or not, the attribution of the bones as being those of St. Eanswythe is to use one small bone for Radio Carbon dating (this would destroy that particular bone) and I think it would be well worth doing." A public meeting at the church was held on Monday 6th June 2016, to discuss a project called “Finding St. Eanswythe”, which was to carry out Radio Carbon dating of the remains. However as St Eanswythe was a Royal Princess the remains like the alleged remains of possible one or both ‘Princes in the Tower’ project to do carbon dating on the remains might not be granted the Queen’s Royal Approval.